The wrestling team defeated Wilkes University 32–6 Feb. 12. The No. 2-ranked wrestling squad took down SUNY Oswego 45–3 on Dec. 12 to improve its record to 4–1 on the season. The Ithaca College football team’s comeback fell short against rival SUNY Cortland in the 57th annual Cortaca Jug game by a final score of 11–8 at Butterfield Stadium. The Bombers’ football team anticipates a gritty matchup in preparation for the 2015 Cortaca Jug game. The Bombers football team took a 7–3 loss to Buffalo State University on Nov. 7 in Buffalo, New York. The Bombers took their fourth consecutive loss of the season. Football beat writer Dustin Albino lists four keys to the football team’s game against St. John Fisher College on Oct. 31 at Butterfield Stadium. Josh Oliver has been a force to be reckoned with since his freshman year on the Bombers football team. The football team will face off against the Hartwick College Hawks at 2 p.m. Oct. 10 in Oneonta, New York. 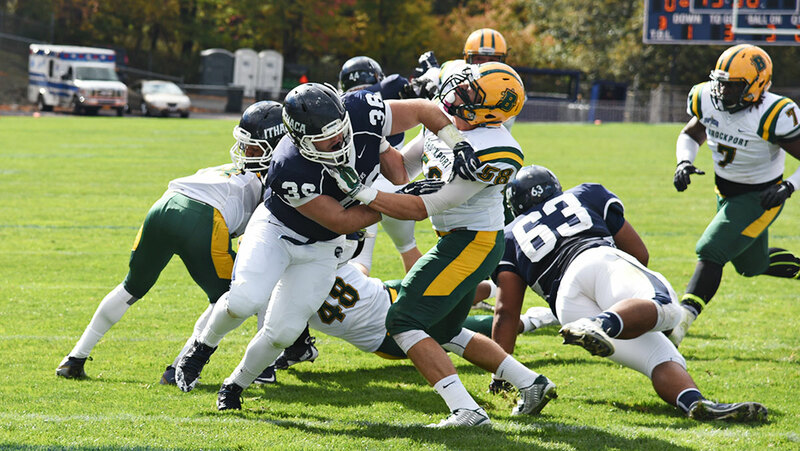 The football team will take on Utica College on Oct. 3 in Utica, New York after a 3–0 start to the season. The No. 20–ranked Ithaca College football team will look to stay undefeated this weekend as the Bombers host the 3–0 Alfred University Saxons at 1 p.m. Sept. 26 at Butterfield Stadium.